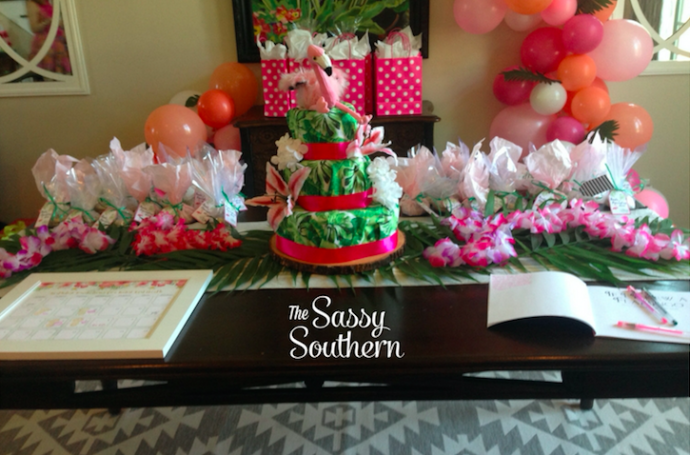 When the sweet mommy-to-be first said that she wanted a Tropical themed baby shower, I knew I was out of my element. Aside from a Hawaiian luau before my high-school graduation, I had not come close to attempting a tropical themed party! 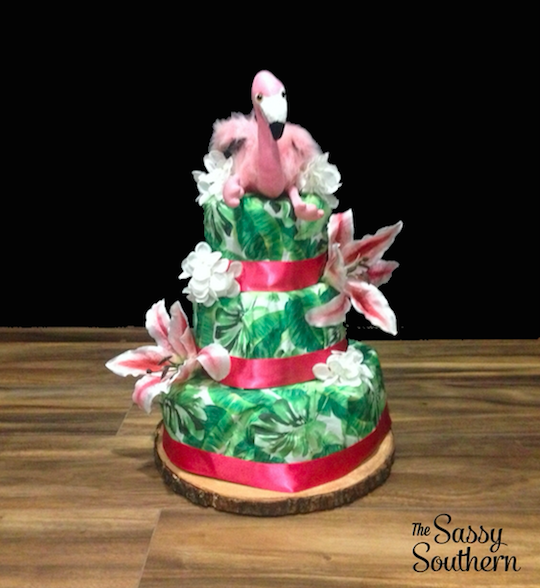 She decided she wanted the focus to be flamingos and pineapples, so I at least could narrow down the focus of my decor! It also helped that her shower was in April and every store buyer had decided that they also loved pineapples and flamingos. 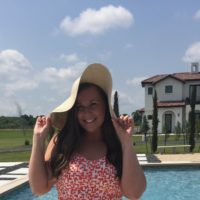 I started searching Pinterest for inspiration, as we all do at some point during the day, and I started to get an idea of what I wanted to do. 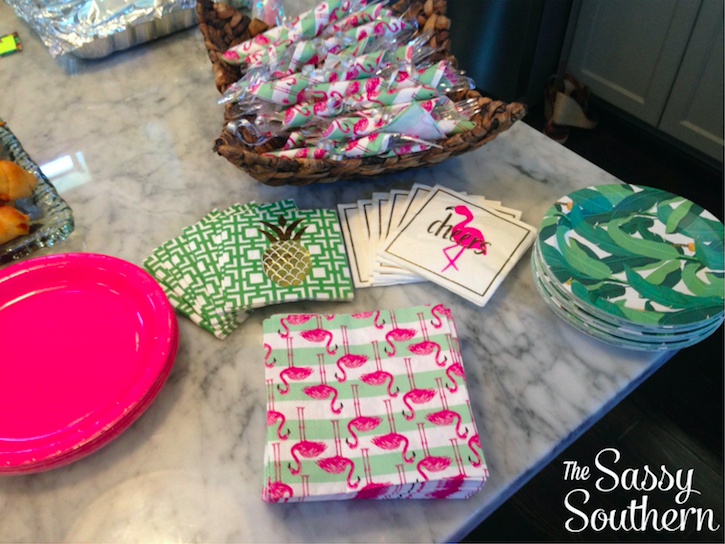 Here are my top tips for hosting a tropical baby shower! 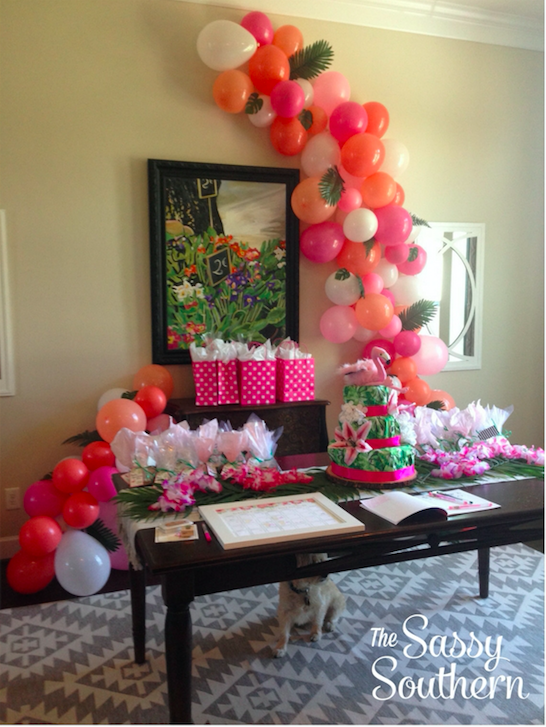 The biggest focal point of the baby shower decor was definitely the tropical balloon arch! 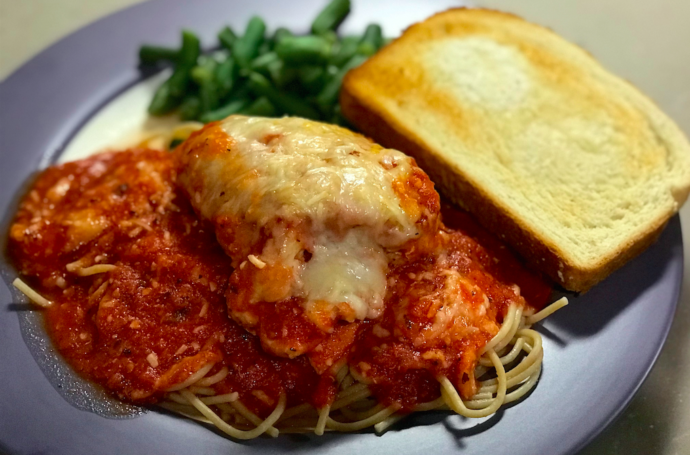 This was so much fun to make and was a huge hit! Find everything you need and how to make the balloon arch here! The Centerpiece! I wanted to make décor for the shower that would also act as a gift. The diaper cake was actually very easy to make and it looked wonderful as the centerpiece for the sign-in table! It was also stuffed with 96 diapers and topped with an adorable stuffed flamingo. Learn how to make this diaper cake here! 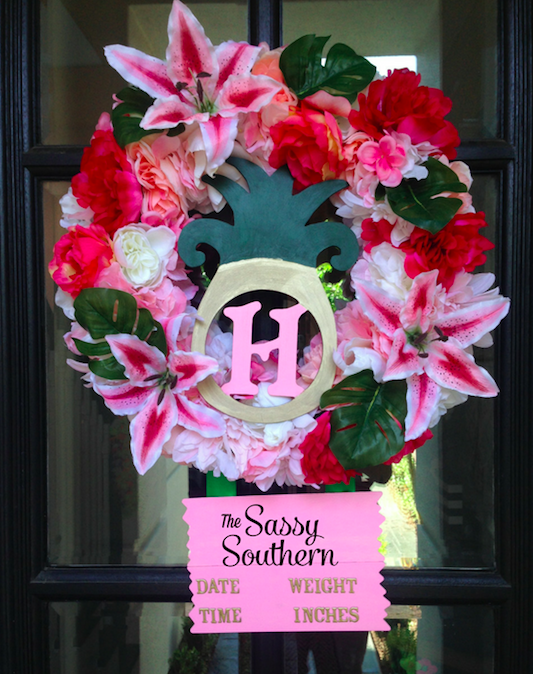 I absolutely LOVE the custom door wreaths for the hospital door to welcome visitors to meet the sweet new baby! They look great at the shower and even better on the hospital door! They are also super easy to make. Check out my how to build a tropical themed diaper wreath here! One of the other hostesses was handling the food and I knew it would be absolutely delicious and adorable! I wanted the plates, napkins, cups, and straws to really make a statement and fit our adorable theme. I really hit the jackpot with Etsy, Amazon, and Target! Napkins: I found these adorable pineapple napkins on Amazon for $12 for as package of 20! 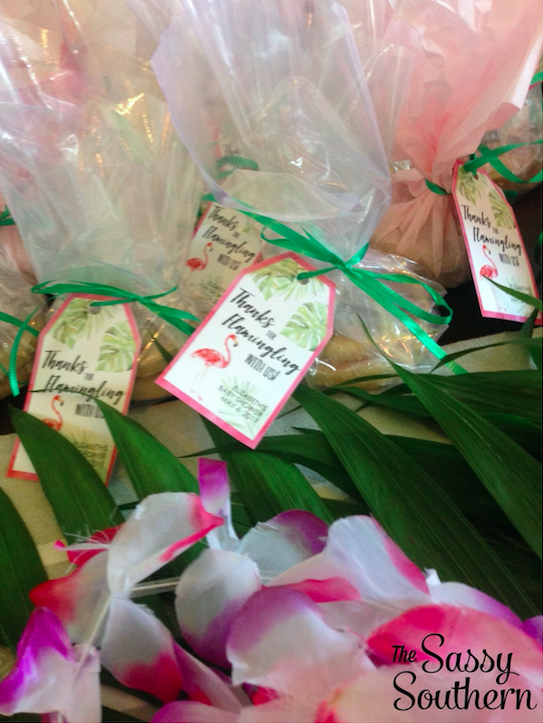 The pink Flamingo napkins came from the Target dollar section and the green and pink flamingo napkins came from Papyrus. Plates: I purchased the pink plates from Hobby Lobby and found the adorable palm plates from SPSweet Creations on Etsy! 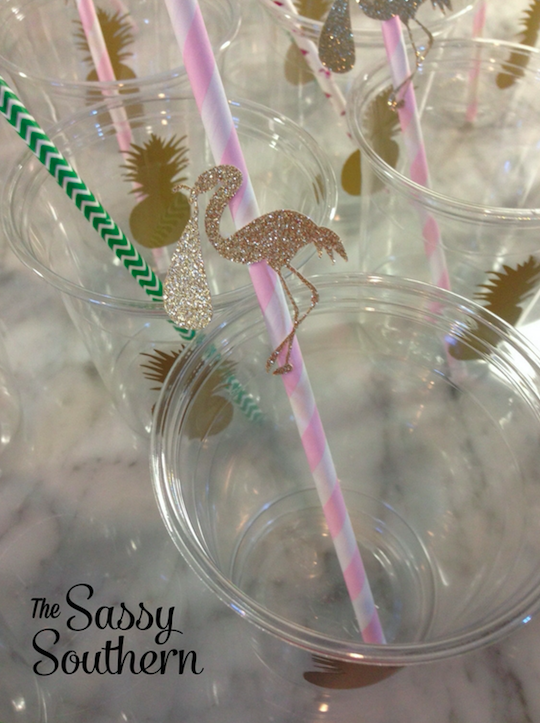 Cups and Straws: I am still obsessing over these flamingo stork straws! They are just too perfect! I found these at Paper Trail on Etsy! I bought the pineapple cups from TipTopSupply4U on Etsy! 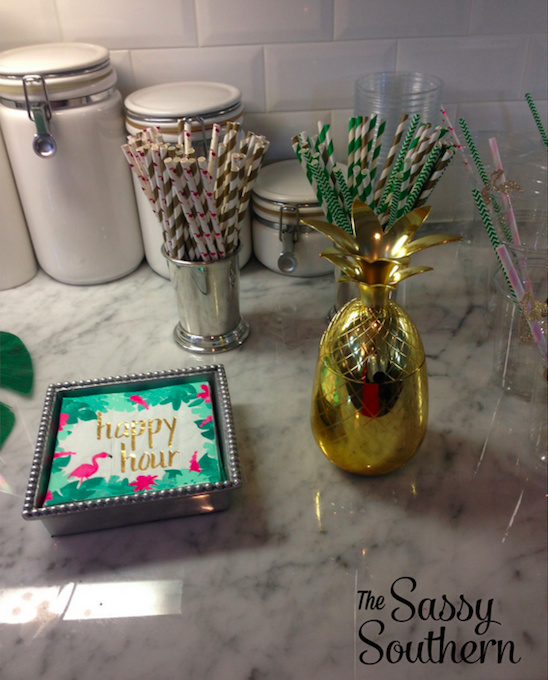 The mommy-to-be got her very own gold pineapple tumbler! I found this at Target and for all of my essential oil lovers, the inside is stainless steel, so you can add your favorite oils to your beverage! I thought this really put the whole tropical theme over the top! I wanted to really pull in the tropical theme with the serving platters, so I found these tropical leaves from Oriental Trading Company to act as placemats under the serving trays. I paid only $8.99 for 12! I wanted pineapples incorporated in as many areas as possible! I found some beautiful pineapple vases, but they were crazy expensive! So instead, I cut out a pineapple and spray painted it gold! It really did look lovely with these tropical flowers! I wish I could tell you that I was able to use the pineapple after I cut it out, but it was more like pineapple pulp when I was finished with it. Maybe it will be edible the next time I try to make a vase. 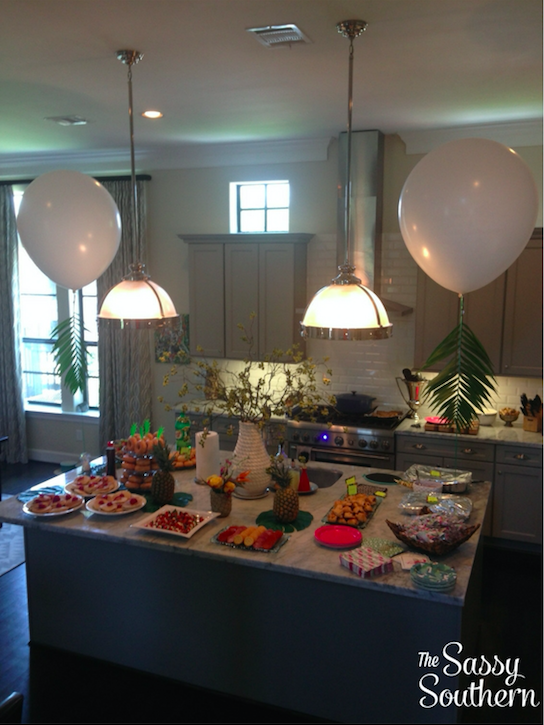 I taped palm leaves to the strings of these 36” balloons to help tie in the Tropical theme. Iove these balloons, but they can be SO expensive! Even after you purchase the balloon, you still have to pay for the helium and most party places charge $15 per balloon! That is just insane! I found a pack of 10 on Amazon for only $13.99! I took them to Kroger’s floral department and the inflated them with helium for only $5 each! I was thrilled! They really make the perfect statement piece! 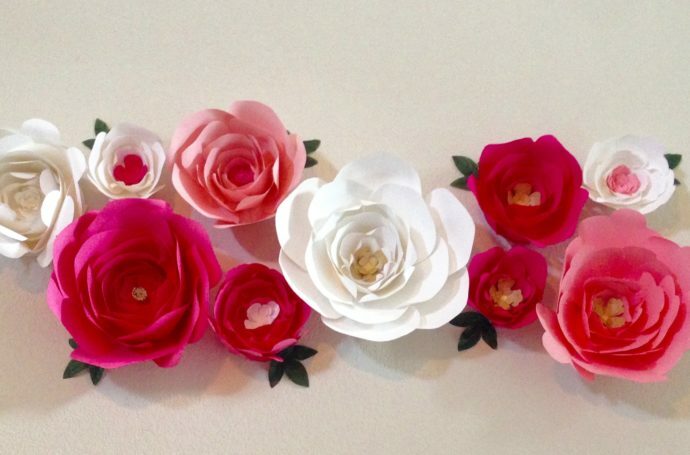 One of my favorite things about Etsy is how you can customize so many things! I messaged the shop that designed the shower invitations and asked if they could make this guess the date sign to match the invitations and they, of course, were happy create a custom listing! I had it printed at a FedEx Office and purchased a frame at Michaels. This example is an 11×14. I also bought a pineapple stamp from Hobby Lobby and had the guests stamp and initial the day they thought the mommy-to-be would go into labor. 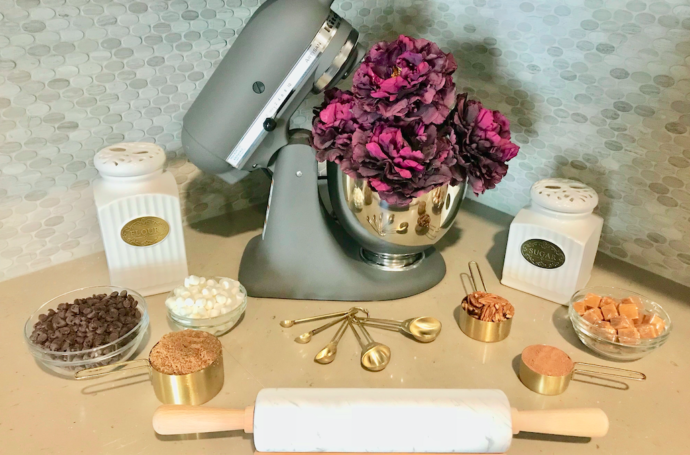 This was a great activity and looked great with the décor! Then, the mommy-to-be can display it in the baby’s nursery or use the frame for a different picture. I love the idea of a guestbook, but if we are being totally honest, most guest books just end up on a bookshelf collecting dust. 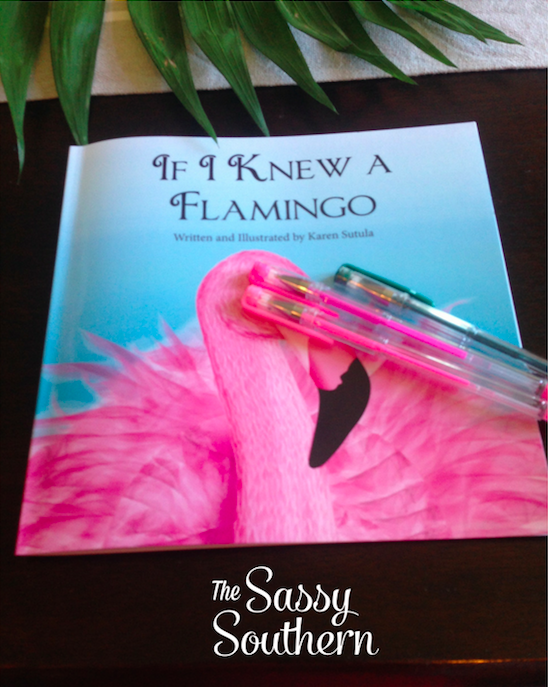 I found this sweet children’s book on Amazon about Flamingos and decided this would be the perfect guest book. Each guest wrote the baby a sweet note in the book and it looked fantastic on the sign-in table! 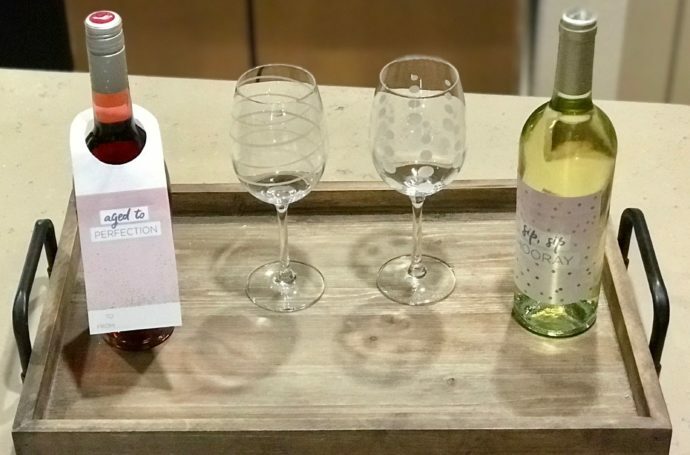 One of our closest friends gave us a wine basket for our wedding gift. Each wine bottle represented a milestone we would reach together in our first year of marriage. We are STILL enjoying this beautiful gift. I saw the same idea on Etsy from Lush Label, but for Mommy Milestones. 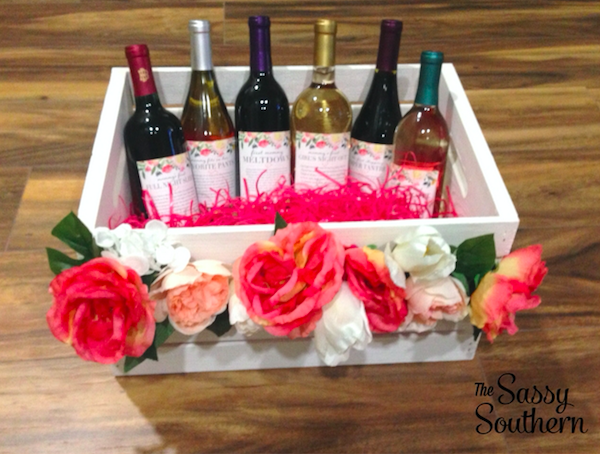 It looked amazing on the gift table and it was a huge hit with the mommy and daddy-to-be. See the full supply list here! 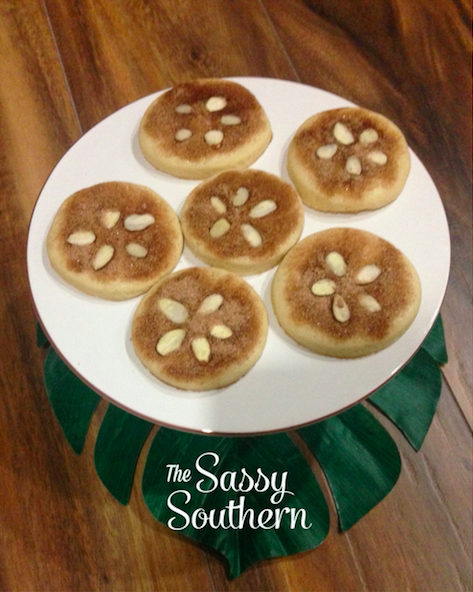 The mommy-to-be found these delicious sand dollar cookies online and thought they would make the perfect favors! 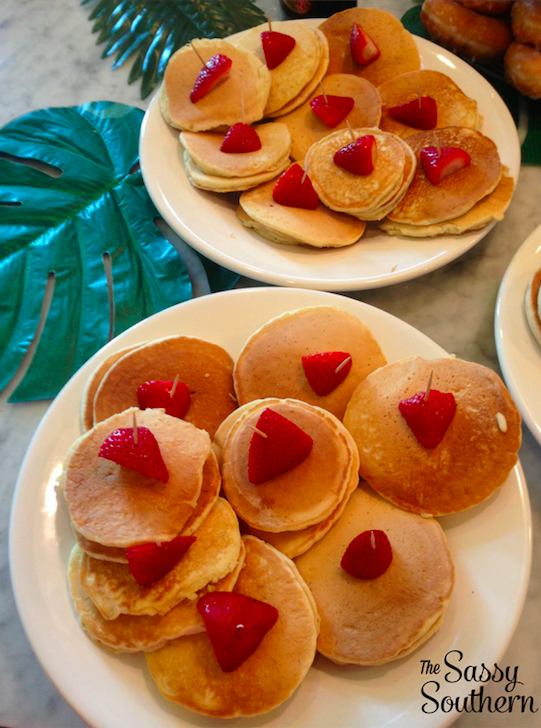 I found this recipe from Mamma Miss and they turned out great! I wrapped two in cellophane and tied it with a bow and these adorable favor tags from Peekaboo Chew Prints! I also had these printed at FedEx Office on a heavy cardstock. 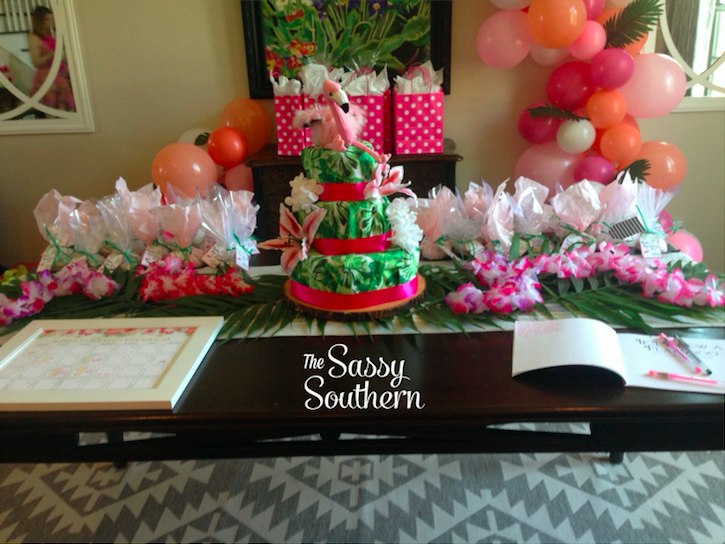 This Tropical themed baby shower was such a success. 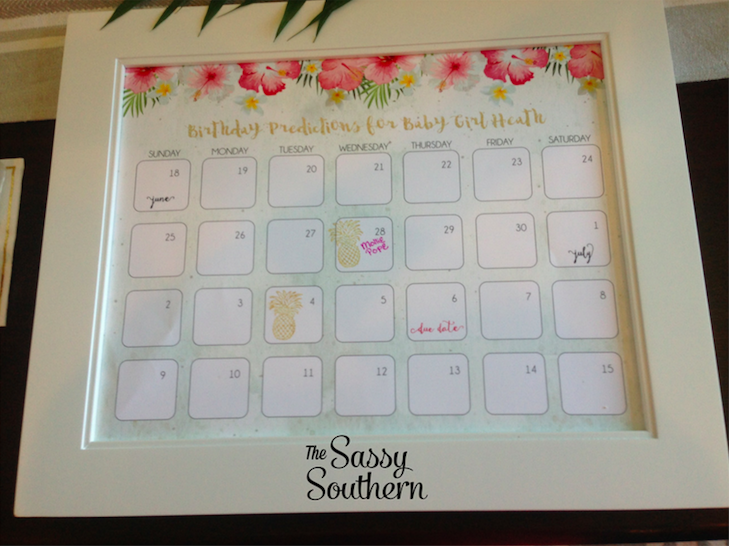 I hope you enjoy planning your baby shower as much as I enjoyed planning this one! That’s amazing! You are a good friend. 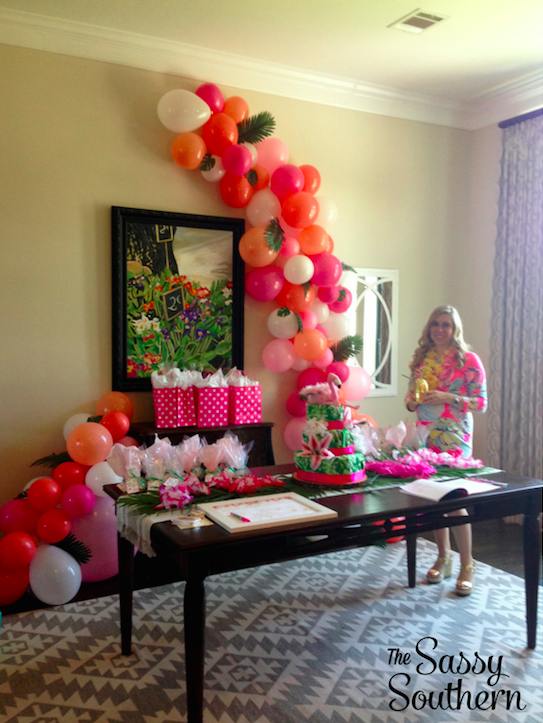 I can’t decide what is my favorite part…the balloon arch, diaper cake, or wreath! So pretty. Thank you so much, Kristen! It was all so fun to do! I love all the decor! It’s so bright and fun and colorful! So sweet of you to throw the shower! Thank you so much, Kristi! It was so fun to do! I love this! What a great theme and you did so well with it! Thank you so much, Kari! 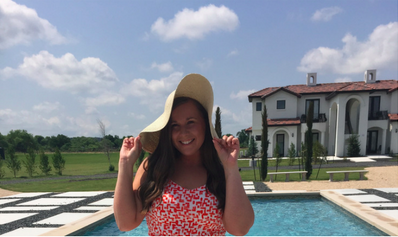 I had so much fun putting it together! I love it. That is the fanciest baby shower I have seen. What a gorgeous set up! Love the tropical theme! Thank you so much, Maggie! It was so much fun! 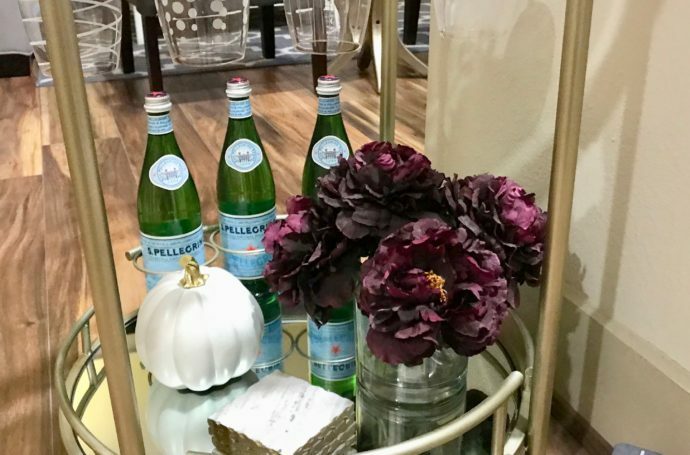 What an adorable theme for a shower! 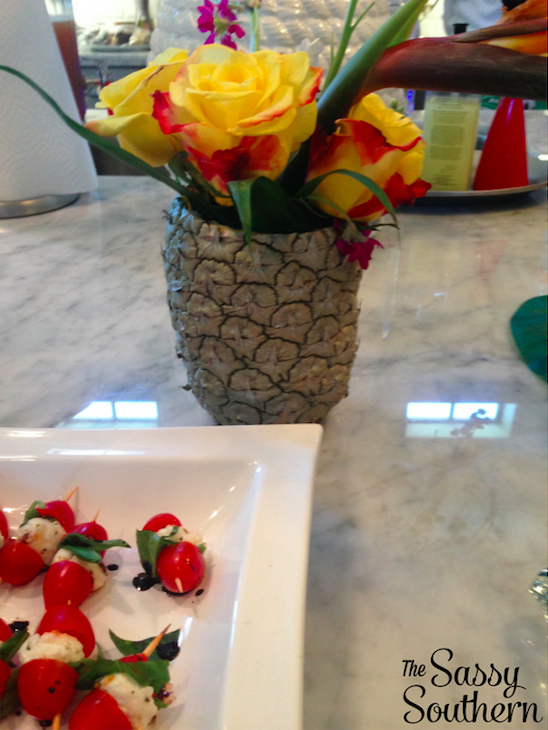 Genius idea to use a real pineapple for the flower vase. Too cute! SUPER cute! I love the “sand dollars”! Thank you, Ashley! I did a test run first and ate sooo many, lol! This is absolutely adorable! Great job! You threw a beautiful and unique baby shower! Love the decor and food! Thank you so much, Melina! It was so much fun! These are such cute ideas! I love it! Will have to save if I throw a baby shower. Thanks for sharing! Thank you so much, Anitra! Thank you, Rebecca! It really was a lot of fun to do! You did such a great job. So festive and happy. I’d love to do this for a birthday party. Great decor and theme! I love anything tropical and you did a great job with this.